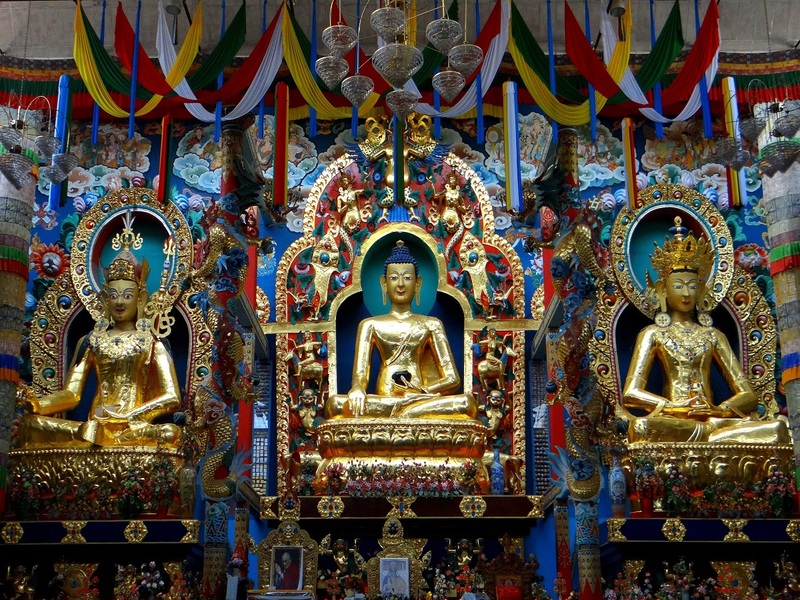 At a distance of 34 km from Madikeri, 4.5 km from Kushalnagar, 7 km from Cauvery Nisargadhama & 87 km from Mysore, the Golden Temple or Namdroling Monastery is a beautiful Buddhist Monastery situated in Bylakuppe. Bylakuppe is the second largest Tibetans settlement in India after Dharamshala. 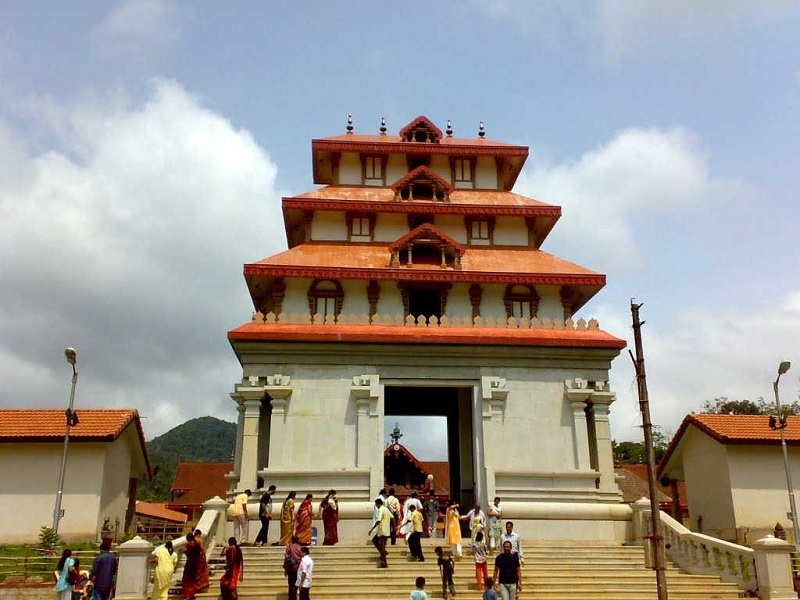 This Buddhist Monastery is one of the most popular tourist places to visit in Coorg and among the prime place to visit on a Coorg tour. Bylakuppe is a Tibetan refugee settlement area established by Lugsum Samdupling in 1961 and Dickyi Larsoe in 1969 and is situated to the west of Mysore district close to Bangalore - Coorg route. The main tourist attraction here is the magnificent Namdroling Monastery. Popularly called as Golden Temple, the Namdroling Monastery was established by Drubwang Padma Norbu Rinpoche in 1963. This is the largest teaching center of Nyingmapa, a lineage of Tibetan Buddhism, in the world and is home to a sangha community of over 5000 monks and nuns. The Golden Temple complex is huge and it houses 40 feet high gilded images of Guru Padmasambhava (also known as Guru Rinpoche), Buddha Sakyamuni and Amitayus. The temple tower is highly ornate. The outer walls flanking the doorway are decorated with huge colorful murals. The doors, red in color, have huge gold knockers and a thick plaited rope with tassels hanging from it. The walls are adorned with colourful paintings depicting gods and demons from Tibetan Buddhist mythology. The monastery not only attracts large number of young Tibetans seeking enlightenment and education, but also draws large number of tourists from all over India and abroad. Watching hundreds of Buddhist monks doing religious rituals and offering prayers loudly is an exciting sight. This place is a calm and majestic sight, surrounded by its landscaped gardens. The town is a delight to visit during festivals such as the Tibetan New Year (Losar), which is celebrated with much fervor at the monastery. It is celebrated in February / March over a period of fifteen days. During that time, the monastery hosts traditional colourful lama dances and huge thangkas, a Tibetan silk painting with embroidery depicts Buddhist deity. One can also visit nearby Sera Monastery which is modeled after the original Sera University in Tibet. Sera Monastery belongs to the Gelugpa sect of Buddhism and is the local seat of education. It is situated about 2 km from the main Namdroling Monastery. There are other equally beautiful smaller monasteries; the Sakya Monastery and the Tashi Lhunpo Monastery. Sakya Monastery is a double story structure on the way to the main monastery. Tashi Lhunpo Monastery is one of the four great monasteries of central Tibet and the original seat of the Panchen Lama. This was re-established in Bylakuppe in 1972. Timings: 9 AM - 6 PM, Prayer is at 1 PM and it is a wonderful experience to watch the prayer. At a distance of 9 km from Bhagamandala & 44 km from Madikeri, Talacauvery is the origin of the Cauvery River in Karnataka. It is situated on the slopes of the Brahmagiri mountain ranges near Bhagamandala at an altitude of 1276 m. It is one of the best places to visit in Coorg and is among prime place to visit on a Coorg trip. At Talacauvery, there is a square tank called Cauvery Kundike or Brahma Kundike, which is considered to be the birth place of River Cauvery. Here, River Cauvery emerges as a perennial spring and disappears underground. River Cauvery again emerges at Nagathirtha near Bhagamandala and joins with Kannike and Sujyoti at Triveni Sangam. Bhagamandala is the meeting of three rivers and is also referred to as Triveni Sangam. According to legend, Cauvery was held captive by sage Agasthya in a Kamandala, a pot carrying sacred water. Lord Ganesha in the form of a crow made the Kamandala to topple at this hill when Sage Agasthya was meditating. There is a shrine dedicated to Kaveri Amman near the kundike and a big tank in front of it where devotees baths before offering prayers. The temple was renovated by the state government in 2007. Talacauvery also consists of shrines dedicated to Lord Agastheeshwara and Lord Vinayaka. The Shiva temple here houses a rare and ancient Shivalinga. According to the legend, this is the spot where Lord Shiva appeared before Sage Agasthya. The deity here is known by the name Lord Agastheeshwara. 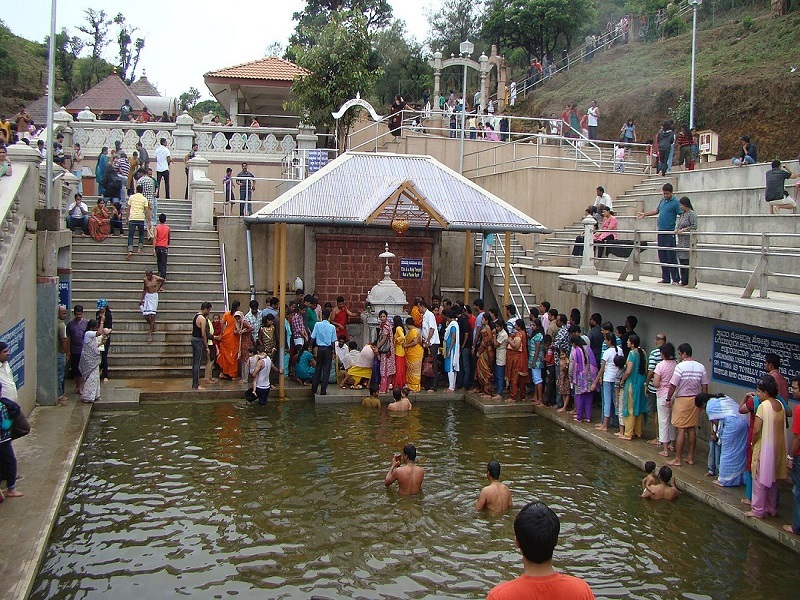 Tula Sankramana which falls in October is the most auspicious day for visiting Talacauvery, as it is believed that on this day Goddess Cauvery appears on earth, which is indicated by a sudden upsurge of the water in the Cauvery (Brahma) Kundike. During this festival, the area becomes very attractive with thousands of lights lit in the temples. Taking bath at this spot on Tula Sankramana is considered very sacred. Apart from being a pilgrimage place, Talacauvery is also a splendid place amidst breathtaking nature. The temple is situated in a breathtaking location in the lap of the Brahmagiri hills. The undulating layer of hills with stretches of green meadows is truly picturesque. There is a flight of steps leading up to the summit of the Brahmagiri Hill, which offers a feast for nature lovers. 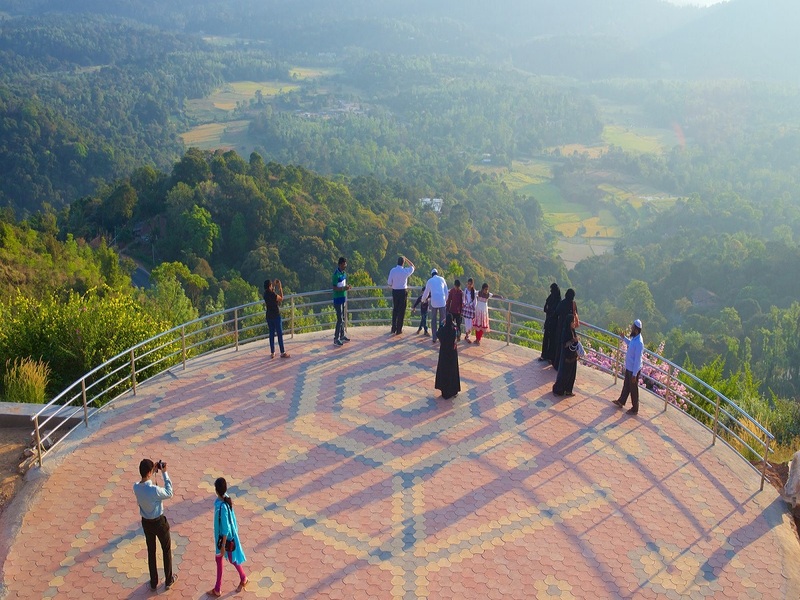 At a distance of 1.5 km from Madikeri Bus Station, Raja's Seat is a popular viewpoint towards the south of Madikeri Fort in the picturesque hill town of Madikeri, Coorg. This is one of the top tourist places to visit in Coorg and also a famous sunset point in Madikeri. The Raja's Seat, which means the Seat of Kings, is a brick and mortar structure with four pillars connected by arches. It is built on a high elevation with a commanding view of the cliffs and valleys. This lovely spot was once a favorite place of recreation for the King of Coorg. He used to spend time with his queen in the garden and watching the setting sun. The spot offers a breathtaking view of towering hills, green valleys studded with paddy fields. It is fascinating to watch the road to Mangalore like a curved ribbon lying in the valley. Raja's Seat stands inside a splendid garden of seasonal flowers and musical fountains developed by the Karnataka Government. The garden becomes a colorful sight when the plants are in full bloom. The fountains dance to the tune of rhythmic music and gush out colorful water. The spot attracts lot of tourists and morning walkers. The best time to visit Raja's Seat is during the early morning and evening hours. The early morning hour offers a splendid view of the sun rising behind the mist laden mountains. The golden rays of the setting sun offer a wonderful sight to watch in the evenings. There is also an attraction of the Toy Train for children. This train takes adults and children around the park to enjoy a spectacular view of the mountains. At a distance of 8 km from Madikeri Bus Station, Abbey Falls or Abbi Falls is a wonderful waterfall situated amidst the mountains of Western Ghats in Coorg. This falls is one of the best places to visit in Coorg and also one of the most visited waterfalls in Karnataka and among the best waterfalls near Bangalore. It is one of the top tourist places to visit in Coorg and is another popular attraction not to miss in a Coorg tour Package. British called Abbey Waterfalls as Jessy waterfalls in memory of Jessy, the daughter of Madikeri's first British Captain Chaplain. Abbey Falls is situated in the middle of a private coffee plantations and spice estates. Numerous small streams and abundant rainfall combine to form the Abbey Waterfalls. 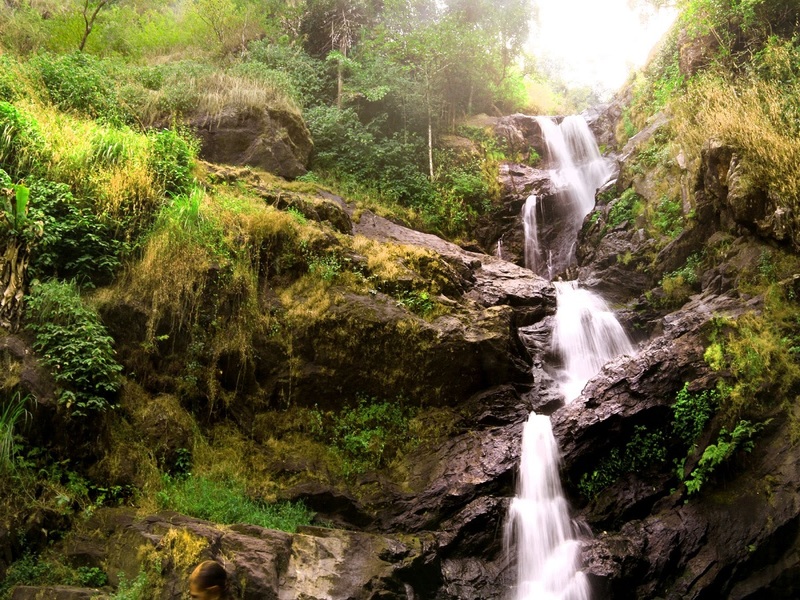 It is one of the best waterfalls in Coorg region. This waterfall flows to unite with the River Cauvery. Abbey Falls cascades down the rocky slopes from a height of 70 feet into a pool. A hanging bridge has been built across the gorge here, from where the visitors can get a beautiful view of the falls. The sound of the waterfalls can be heard from the main road during the rainy season. A Kali Mata temple on the other side of the bridge is also not to be missed. The path leading to the waterfalls is filled with thick vegetation and offers wonderful experience. The best time to visit will be during the monsoon when the waterfalls in full gush and also during the beginning of winter. Cars can reach the entrance of the falls from where a 10 minutes' walk through coffee plantations takes one to the waterfalls. It's not possible to get into the water here and any attempt is also dangerous. September to January is the best season. At a distance of 29 km from Madikeri and 15 km from Kushalnagar, Dubare Elephant Camp is an elephant training center situated on the banks of the river Cauvery in Kodagu district of Karnataka. Dubare is a natural island formed by Cauvery River. Dubare is one of the most famous places to visit in Coorg and also one of the top attractions you must include in Coorg packages. Dubare is an important base for the Karnataka Forest Department's elephants. Dubare Elephant Camp is a project undertaken by forest department and jungle lodges & resorts. This camp has plenty of elephants which are trained under naturalists. The elephants used for Mysore Dussehra are trained at this camp. The trainers explain the various aspects of elephant history, ecology and biology. Visitors can also participate in various activities involving elephants like feeding the elephants with ragi, jaggery, sugarcane, banana and coconuts. Tourists can also watch elephants being given a scrub-bath in the river and also watch how oil is applied on their forehead, tusks etc. There are opportunities for trekking, elephant rides, coracle ride, bird watching, fishing, and river rafting. River rafting at Dubare is one of the top things to do in Coorg. These activities are hosted by jungle lodges and resorts. The forest department conducts trekking into the forest surrounding the camp along the Cauvery River. Visitors also have an option of going on a coracle boat ride on the River Cauvery here. Do not forget to watch out for the crocodiles sunning on the river banks while enjoying the coracle rides. Fishing is allowed with the prior permission from the wildlife society. The forests of Dubare are home to many wild animals and birds. The sighting of wild Asiatic elephants are regular and there is a possibility of spotting sambar, spotted deer, tigers, leopards, wild dogs and gaur. Bears are also seen in these forests. The forest is also home to many non-venomous snakes and reptiles. Kingfishers, peacocks, woodpeckers and peacocks can also be found in the forest. The best time to visit Dubare Elephant Camp is between the months of September and March. In addition to elephant training camp, Nisargadhama and Veerabhoomi are the other main attractions of this area. Jungle Lodges and Resorts maintain cottages at the camp. One can take an hour elephant safari through the entire camp which will be available twice a day. Day Visit: Rs. 1447 for Indians, Rs. 1690 for Foreigners (includes Lunch, Tea / Coffee, Coracle ride, Elephant ride, Camera fees & taxes). At a distance of 29 km from Madikeri, 3 km from Kushalnagar, 7 km from Bylakuppe & 12 km from Dubare Elephant Camp (close to the main road between Madikeri - Kushalnagar), Cauvery Nisargadhama is an island formed by the River Cauvery in Kodagu district of Karnataka. It is one of the most scenic Coorg tourist places and also a famous picnic spot for people of Coorg. This island was developed as tourist spot in 1988 by the Forest Department. Spread over a sprawling 64-acre land, the island is filled with thick bamboo groves, sandalwood and teak trees. The island is accessible through a hanging rope bridge. This island also features deer park, Rabbit Park, Peacock Park and Orchidarium. The Island is perfect for a picnic with the children. It is also an ideal destination for those who love nature and spend time by themselves. It is very good site for seeing parakeets, bee eaters and woodpeckers and a variety of butterflies. 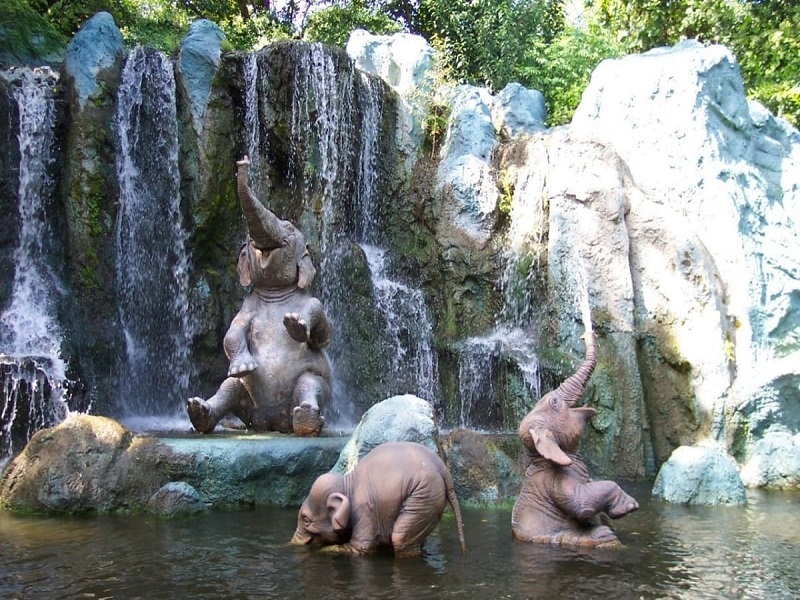 Elephant rides and boating are the major attractions here. Tourists are also allowed to get into the water at a few safe points along the river. 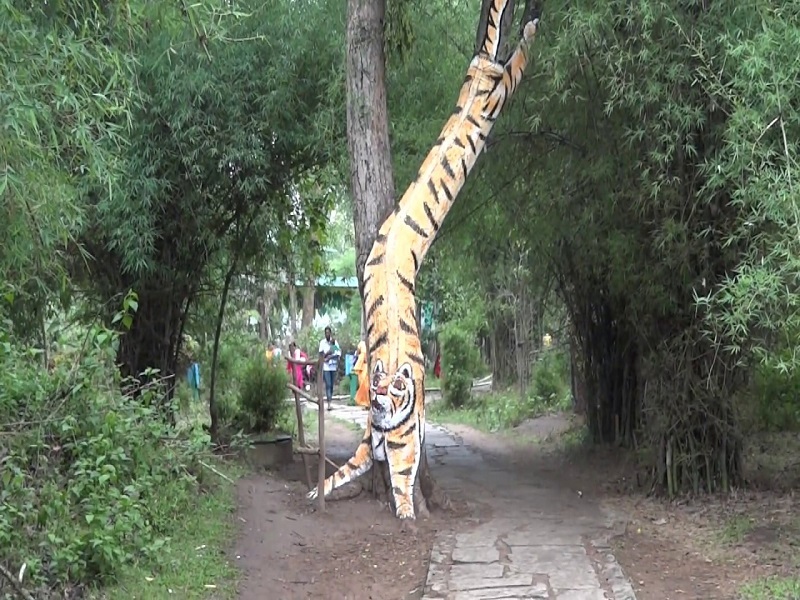 There are tree top bamboo cottages and forest run department guest houses for accommodation. There is one small restaurant as well. October to April is the best time to visit this island. At a distance of 1 km from Madikeri Bus Station, Madikeri Fort is a historical fort situated in the heart of Madikeri town in Coorg district of Karnataka. Still preserving its old charm, Madikeri Fort is one of the most famous tourist attractions in Coorg. Madikeri Fort was first built by Mudduraja, the then king of Coorg, in the last quarter of the 17th century AD. The king had also constructed a mud palace inside the fort premises. The fort was built as a mud structure and was rebuilt in stone by Tipu Sultan in 1781 AD and named the site as Jaffarabad. 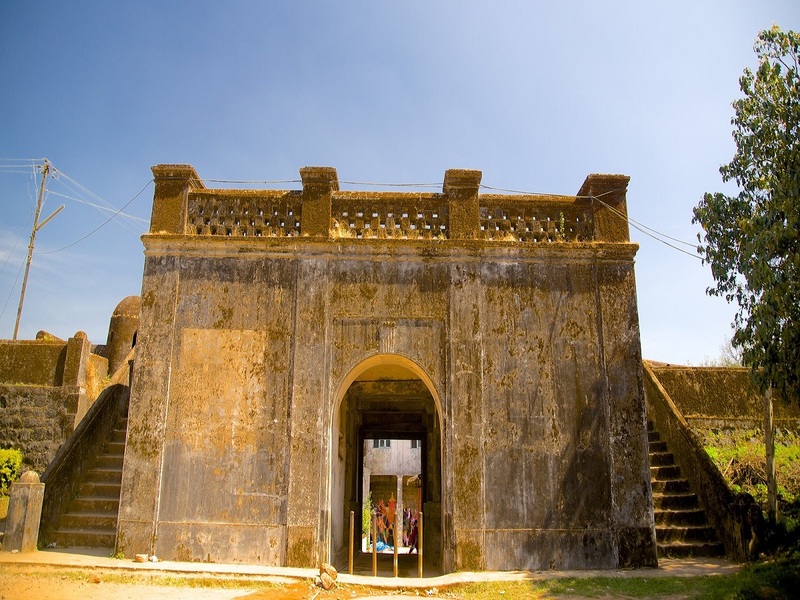 In 1790 AD, Dodda Veerarajendra took control of the fort. The fort faced further changes and renovations during the period 1812 - 1814 AD when it came under the rule of Lingarajendra Wodeyar II. In 1834 AD the fort was captured by the British. The Madikeri Fort showcases beautiful architectural designs. The two storeyed palace in the fort complex is a huge and spacious one which is about 110 feet in length. It was renovated by the British and added a grand clock tower in 1933 AD. The palace also has a sculpture of a tortoise with the initials of King Vijayarajendra engraved on it. Two life-size stone replicas of elephants in the north-east corner draw the attention of the visitors upon their entrance to the fort. It is believed that the fort has few secret passageways and that adds to the mystery of the fort. In the inner fort, a temple of Virabhadra was removed by the British in 1855 and in its place a church was built. The Church in Gothic style with colour stained glasses has now been converted into a museum by the Archaeological Department. This museum contains several items related to history - mainly the British era and also has a huge portrait of Kodagu's eminent personality Field Marshal K.M. Cariappa. The Mahatma Gandhi Public Library, the Kote Maha Ganapathi temple and the district prison are also situated inside the fort. Today the fort premises house the Madikeri Deputy Commissioner's Office. At a distance of 1 km from Madikeri Bus Station, Omkareshwara Temple is an ancient and magnificent temple situated near Madikeri Fort in Madikeri. It is one of the top places of pilgrimage in Madikeri and also one of the popular places of pilgrimage in Coorg. Dedicated to Lord Shiva, Omkareshwara Temple was built by Lingarajendra in 1820 CE. The Shivalinga installed inside the temple is believed to be brought from Kashi. According to the legend, the king had killed a pious Brahmin to fulfill his political ambitions. However, the king started to have nightmares for his cruel deed. In order to free himself from the nightmares, the King sought the advice of a few wise men and they told the king to build a temple of Lord Shiva to regain his mental peace. The king followed their advice and brought a Shiva lingam from the holy town of Kashi and installed it at a newly constructed temple. The Shivalinga was named as Omkareshwara and regular rituals were performed. The temple was built in both Islamic and Gothic style of architecture. The structure of the temple comprises of a large central dome with four minarets standing at four corners. The walls of temple are decorated with intriguing paintings and the bars of the windows were made of Panchaloha. The history of the temple is inscribed on a copper plate, which has been fixed at the entrance door frame. Opposite the temple is a huge tank, with a mantapa in the center, connected by a causeway. A large number of fishes can be seen playing in the water of the tank and devotees are allowed to feed them. Mahashivratri is the major festival celebrated with great pomp and fervor at the temple. At a distance of 248 km from Bangalore, 110 km from Mysore, 75 km from Madikeri, 48 km from Virajpet, 32 km from Gonikoppal, 20 km from Nagarhole National Park, 10 km from Kutta & 10 km from Srimangala, Iruppu Falls is a magnificent waterfalls situated in Brahmagiri Hills between Srimangala & Kutta in Coorg district of Karnataka State, bordering the Wayanad district of Kerala. 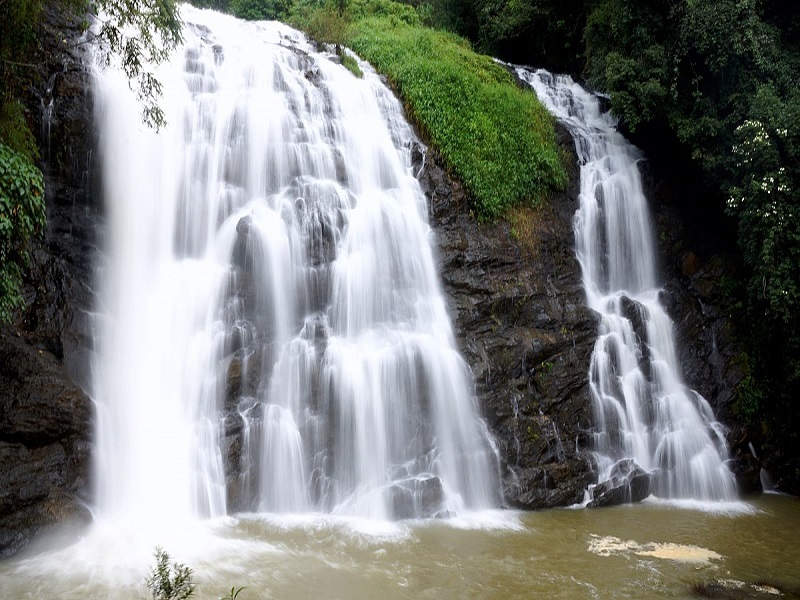 It is one of the best waterfalls in Karnataka and also one of the well-known Coorg tourist places. It can be visited as part of 2 day trip from Bangalore. The Irupu Falls or Iruppu Falls is also known as Lakshmana Tirtha Falls locally. It is formed by Lakshmana Tirtha, a stream originated in Brahmagiri Peaks and joins Kaveri River. According to the legend, Lord Rama and his brother Lakshmana passed along the Brahmagiri range in search of Sita. When lord Rama asked his brother to get some drinking water, Lakshmana shot an arrow at the Brahmagiri hills and brought into being the river Lakshmana Tirtha. Iruppu falls is another popular attraction not to miss in a Wayanad tour package. Dropping from a height of 170 feet through several stages, the falls are situated amidst thick forest of Western Ghats. The roaring waters of the Irupu Falls and the picturesque surroundings make it a favorite picnic spot. It is an unforgettable experience to stand at bottom of the cascades and play in the sizzling waters of the falls. Iruppu Falls is a part of the Brahmagiri forest range, there is a trek route that leads to the Narimale forest camp and then on to Brahmagiri Peak. Permission from forest department is needed for doing this trek. There is a temple called Rameshwara Temple dedicated to Lord Shiva is located on the banks of the Lakshmana Tirtha River, enroute to the falls. It is said that Lord Rama himself installed the Shiva lingam inside the temple. 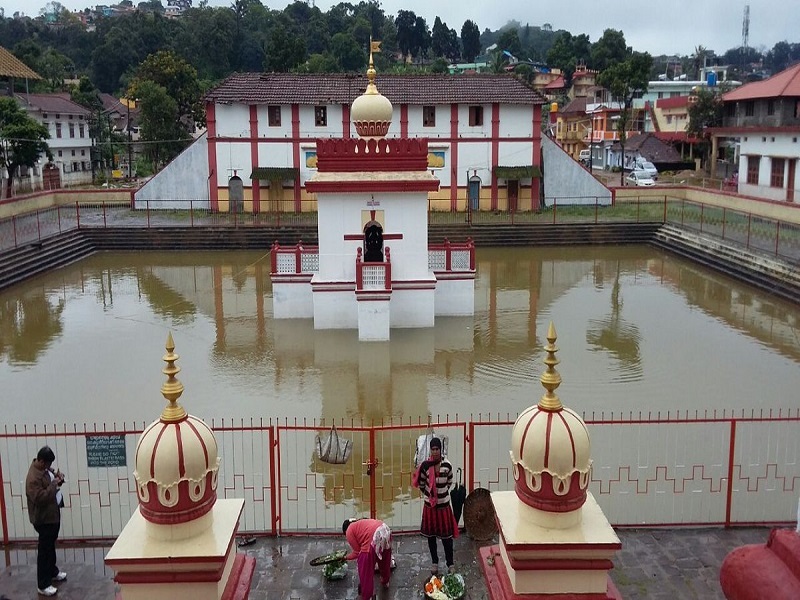 This temple attracts a large number of pilgrims during the festival of Shivaratri. The falls can be reached by taking a right diversion after Srimangala (while driving from Gonikoppal) between Srimangala and Kutta. The diversion is at about 2.5 km from Srimangala and road continues through coffee estates for another 6 km. Approach road is available till Rameshwara Temple which is the entry point to Brahmagiri Hills & Irupu Falls (an entry fee has to be paid here). From here, the falls is 15-20 minute walk through thick forest (the walk is easy through well laid path & steps). Private vehicles can be hired at Kutta or Srimangala to visit the falls (options are limited from Srimangala). Kozhikode Airport is the nearest airport, which is about 145 km from Iruppu Falls. Mysore Junction Railway station is the nearest station which is about 110 km from Irupu Falls. Kutta is the nearest Bus station to Iruppu Falls. It is well connected by bus from Mysore, Madikeri, Virajpet, Gonikoppal, Kozhikode & Kalpetta. Kutta has various accommodation facilities. The falls is at its best in monsoon and post monsoon seasons. The best time to visit Iruppu falls are from August to January while the peak season is from September to December. Usually it takes half day to visit Iruppu Falls. At a distance of 10 km from Kutta, 20 km from Iruppu Falls, 62 km from Kalpetta, 88 km from Mysore, 88 km from Madikeri and 218 km from Bangalore, Nagarhole National Park is one of the best wildlife sanctuaries in South India and also one of the top places to visit in Coorg. Also known as Rajiv Gandhi National Park, it is spread across Mysore and Kodagu districts in Karnataka. Nagarhole National Park is one of the top attractions you must include in Coorg tour packages. Originally the forest area was the private hunting ground for the Maharajas of Mysore. Nagarhole was converted into a sanctuary in the year 1955 covering an area of 258 sq. km and subsequently enlarged to include the adjoining areas of Mysore district and now extends over an area of 643 sq. km. Nagarhole got National Park status in 1988 and declared as 37th Project Tiger Reserve in 1999. It is part of the Nilgiri Biosphere Reserve. The Western Ghats Nilgiri sub-cluster of 6,000 Sq. km, including all of Nagarhole National Park, is under consideration by the UNESCO World Heritage for World Heritage Site status. This national park gets its name from two Kannada words Naga means snake and Hole means stream. Many serpentine streams flow through the rich tropical forests of the park, which has now been renamed as the Rajiv Gandhi National Park, after late prime minister of India, Rajiv Gandhi. Nagarhole is situated to the north-west of Bandipur National Park which are separated by Kabini reservoir. The park has rich forest cover, small streams, hills, valleys and waterfalls. Inside the park coracle boat riding facility is available in Kabini River. The important animals in Nagarhole National Park are tiger, leopard, wild dog, sloth bear, the hyena, spotted deer, sambar, barking deer, four-horned antelope, gaur, wild boar and elephant. Among reptiles, the marsh crocodile, monitor lizard, rock python and several other species are represented. Other mammals includes the common langur, bonnet macaque, jungle cat, slender loris, leopard-cat, civet cat, mongoose, common otter, giant flying squirrel, giant squirrel, porcupine, jackal, mouse-deer, hare and pangolin. Over 250 species of birds are found at Nagarhole National Park. The park is usually closed for safaris during peak monsoon. Traffic movement is restricted from 6 pm to 6 am every day and the gates are closed on either sides of entry into the forest. Two wheelers, three wheelers and goods vehicles are not permitted inside the park. Safaris are organized in the forest department vans during morning and evening. Government-run 4WD safaris and boat trips are conducted from Kabini River Lodge, which are good options to explore the animals. 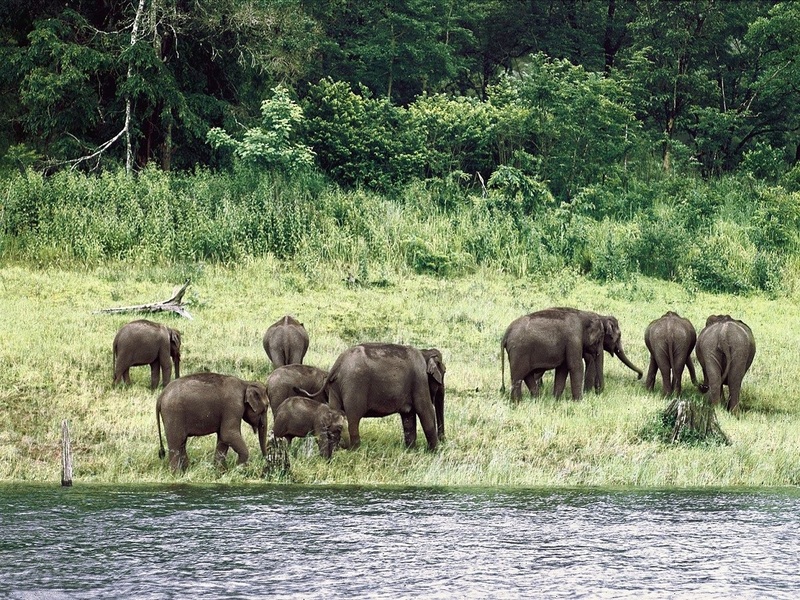 The best time to visit Nagarhole National Park is Nov-May, especially Apr-May. The Forest Department manages two rest houses at Kabini, but reservation has to be made well in advance through the Forest Department offices in Mysore or Bangalore. Various home stays are also available near to Kutta, Srimangala and Gonikoppal. Safari is available at 2 entry points of the park, at main gate near Kutta & at Dammankatte gate near Kabini. For visitors coming from Madikeri, Kushalnagar & Virajpet, safari at Kutta entry point is more convenient. For visitors from Mysore & Kabini, Dammankatte gate is better for Safari, while both the entry points offer equal opportunities for wildlife sighting.